My First Experience was so amazing, I still dream about it! It was dinner time, I walked into the building with H-Baby and we were first greeted by a supermarket then a delicatessen which I’m definitely going to try out soon. We found this passage strange but as soon as we got into Noir and it’s ambiance welcomed us, we immediately decided it was a cute walk-through, functional too if you really think about it…..
We sat down and soaked in the Chic Parisian vibe dangling in the air. Noir is a French restaurant…. Even the menu came dressed elegantly in black. Notice that the “N” in their name is actually mirrored to “И” which I thought was a Russian thing. I began to wonder with excitement if they had French-Russian fusion meals but No, they don’t. To compensate my Russian dream, I went with “White Russian” *laughs* and H-Baby went for a virgin Mai-Tai (Oooo she is Muslim, just incase you are wondering why she’s always “virginy”). Let me know when the woman in the painting speaks to you….. I was slightly offended when my drink came because it looks like the bartender took the liberty to stir my drink when in my head, I was expecting a distinct layer of coffee liqueur at the bottom and cream on top. The waiter didn’t seem to understand my complain so I let it slide and took a sip, one which made me forgive all. I was too hungry to take anything drowned in alcohol and this was perfect….hints of vodka, good dose of coffee taste yet creamy enough….pure delight! 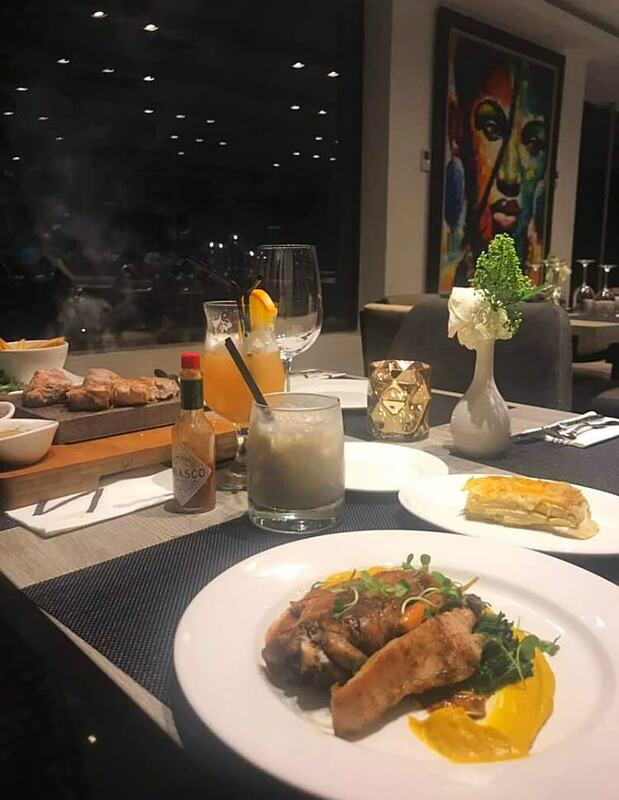 The menu was quite large so I skipped taking pictures but with N15,000, you should be able to have a good meal (one or two courses depending on what you pick) and a drink. But yes, I took a picture of the most interesting/expensive part of the menu and thankfully H-Baby had enough money to try something from there…. She ordered the South African steak and yes we got to be part of the cooking experience which was super exciting! I doubt I can explain this well so you have to try for yourself but it was a lot of tender juiciness and that black pepper sauce was to die for! I lowkey feel guilty because I think I had more of this meal than the owner…..the sauce was truly beautiful! I could not resist taking a picture of the beautiful mess we made with the shells…. I really wanted to eat snails but I was living in “brokelyn” at this time (January blues) so I settled for a baby chicken meal with potato gratin dauphinois which was baked to perfection. My chicken was soft and succulent, I believe I ate the bones because I know my plate was clean after….even the sauce was nowhere to be found! But yes, I still had snails on my mind which is why I had to go back for….. I arrived late so my experience started at the main dish stage…. ESCARGOTS À LA BOURGUIGNONNE (a typical French meal of snails in garlic-butter-parsley sauce) with a glass of white wine…. Taste was everything, definitely worth my coming back! Pretty plate, perfect garlicy sauce, tender snails! Only problem….the portion was small. Will I order it again? Yes, even though I know I need more for that price (N7,200 I think) but Lagos has it’s way of making you not have a choice with overpriced food. I couldn’t imagine leaving hungry so I ordered a starter recommended by YT and her sister-in-law TT….calamari! I also finished this in like 5mins so I have come to the conclusion that I eat too much! YT ordered a salmon dish and it was shockingly dried out, like fried croaker fish. That’s YT….will update you on her vlog soon. She also paid for my meal guys, no one will understand how touched I was, felt like I got my valentines gift to myself for free. Back to Noir, there were quite a number of people cooking their steak that night and it made me realize that there really wasn’t a way for the smokiness from the cooking to escape. My second experience was not the best but then I understand that some days are just off so I am going to try a third time and let you guys know how it goes…. The snail though!!! 😍😍😍 I will try this as well when I arrive. Gosh!!! Wow the mussels looked great. However I am not sure about the snails think I would have to pass on them.